We raise very few Aussiedoodles in a given year, but they are such a favorite of ours ! 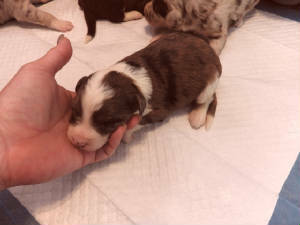 Find us on Facebook at "Regal Kennel" to see what owners of our Aussiedoodles have to say about their pups/dogs. Amazing temperaments, smart, loving, fun. These are our last Aussiedoodles !! 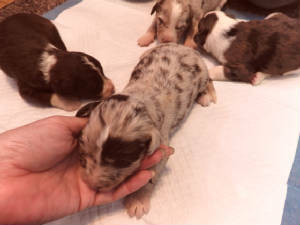 We are retiring our two female Australian Shepherds spring of 2019. 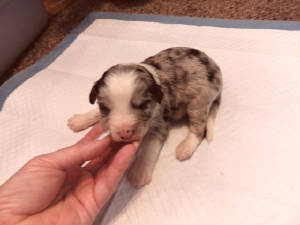 Zoe and Vanner are proud to announce the arrival of an incredibly fabulous litter. They are ready for new homes now. Gorgeous colors ! Super temperaments. So sweet. See Momma Zoe in this video: https://youtu.be/nRk4TW2352I She is retiring from having pups for us so will be available to a pet home very soon. 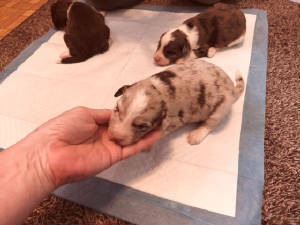 See the female in this video: https://youtu.be/qHlnVv_BfHI Silver with chocolate merle with blue eyes - so stunning !! $1,800. 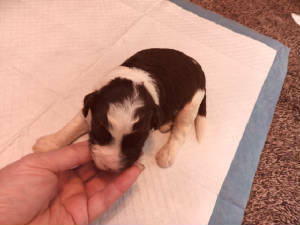 See the males in these videos: Two chocolate and white: https://youtu.be/Fin6mrRhMT8 Two other chocolate and white: https://youtu.be/kt1cSpT0qyk 1 black and white : https://youtu.be/IL-akSSNz_I All of these are $1,000 each.